Much has been written about sport in Australia. Much more has been written about war. 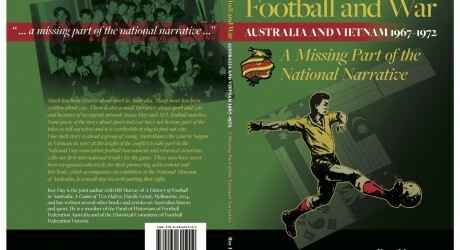 There is also a small literature about sport and war and hectares of newsprint around Anzac Day and AFL football matches. Some parts of the story about sport and war have not become part of the tales we tell ourselves and it is worthwhile trying to find out why. One such story is about a group of young Australians who went to Saigon in Vietnam in 1967 at the height of the conflict to take part in the National Day association football tournament and returned victorious with our first international trophy for the game. These men have never been recognised collectively for their pioneering achievement and the book, which accompanies an exhibition at the National Museum of Australia, is a small step towards putting that right. The Australians with their medals after having won the Vietnam tournament in 1967. Standing from left: Attila Abonyi, Ray Richards, Manfred Schaefer, Dr Brian Corrigan, Roger Romanowicz, Gary Wilkins, Frank Micic (rear), Ray Baartz (crouching), Stan Ackerley (peeking through). 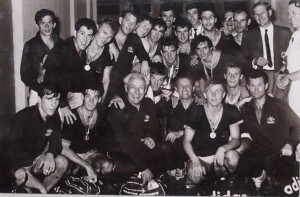 Ron Corry, John Watkiss, Billy Vojtek (leaning forward), Ray Lloyd, Terry Smith (reporter), George Keith, Jim Connell (manager), Martin Royal (ABC reporter). Front: Tommy McColl, Johnny Warren, Lou Lazzari (masseur), Joe Vlasits (coach), Alan Westwater, Ted de Lyster, Tony Boskovic (referee). Source: ASF photograph album, in the possession of Philip Mosely. 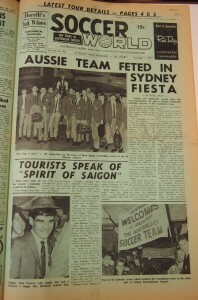 It was reproduced in Laurie Schwab, The Socceroos and Their Opponents, p. 61. The book is fully illustrated and contains the memories of several of the players who took part in the tournament in 1967 and subsequent tours to Vietnam during the war in 1970 and 1972. The exhibition opens at the National Museum of Australia in Canberra in mid-July 2016 and it will run for four years. The display is in the Journeys section of the Museum.